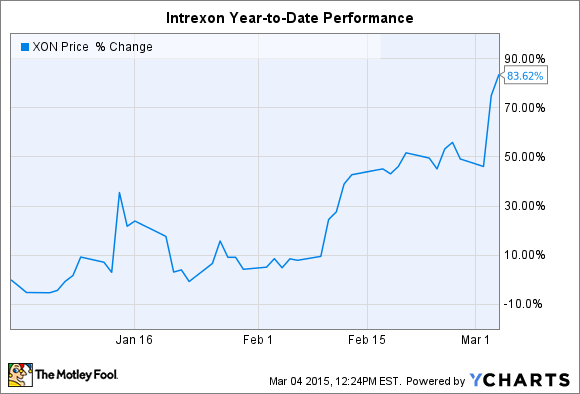 Can Intrexon Corp's Jaw-Dropping Growth Continue after Tuesday's 20% Jump? Next-generation biotech Intrexon kept the growth going in 2014. What powered the company ahead? Where is the company headed? Who said fame only lasts for 15 minutes? Already on a tear entering 2015, synthetic biology leader Intrexon (NASDAQ:XON) roared higher after reporting full-year 2014 earnings earlier this week. A little over two months into the year, Intrexon stock is up over 80%. The company is having no problem finding success by leveraging its technological know-how and making strategic acquisitions and partnerships to further exploit its biologic technologies. The result: amazing growth. While revenue and collaboration count will continue to soar higher in 2015, many investors may still be wondering what the heck is going on. What, exactly, does Intrexon do to deserve an 80% pop to start the year? Was 2014 really that good of a year? Intrexon leverages its technological know-how in engineering biology to create biotech products with healthcare, energy, food, consumer, and environmental applications for partners. It collects fees to conduct R&D and, if a product is successfully commercialized, collects royalty payments on sales of the product. The company also generates revenue from licensing its biotech tools (such as genetic parts) and services (such as DNA construction software). And although the product lineup isn't very deep today, Intrexon generates product revenue from selling biotech products that it owns outright. The year-over-year growth for Intrexon was impressive by all accounts -- even expenses and net loss. Here are the important numbers. Eight collaborators accounted for 82% of the company's collaboration revenue, which included seven healthcare partnerships. But while Intrexon is often revered for its growing pipeline of healthcare assets, 90% of its product revenue was derived "from the sale of pregnant cows, live calves, and livestock used in production." A further 79% of its service revenue was derived from cattle breeding programs. Don't forget, in July 2014 the company acquired Trans Ova Genetics, which is the largest supplier of bovine embryos used to breed livestock in the United States. The resulting cattle provide enhanced dairy and beef production and give farmers more bang for their buck. To be clear, synthetic biology isn't used for the livestock platform just yet, but it's a stark reminder that Intrexon's near-term financial performance will be determined outside of health applications, which typically have long product development cycles. After zooming out from the year-over-year growth comparison to include longer time scales, the company's growth -- the primary reason for investor optimism -- is similarly impressive. The company appears to have a handle on successfully growing its business, although the large losses incurred year after year serve as a reminder that Intrexon has a long way to go before breaking even -- let alone turning a profit for shareholders. It's a long-term investment that requires quite a bit of faith that big revenue streams will develop. Intrexon expects that existing collaborators will have up to 10 novel therapeutic candidates in clinical trials by the end of 2015. While a recent healthcare collaboration with Ziopharm and University of Texas MD Anderson aimed at developing a CAR-T oncology portfolio gets most of the media coverage, there are several other business-building events that will have a more immediate effect on the shareholders. As mentioned above, Intrexon's acquisition of the nation's leading bovine embryo platform will provide a bulk of product revenue. Management expects food applications to deliver product and sales revenue of at least $100 million. It's important to note that doesn't include major contributions from AquaBounty Salmon (yet to be approved) or the recent acquisition of Okanagan Specialty Fruits (the owners of the now infamous Arctic Apple, which doesn't brown when sliced). Either way, the guidance calls for a giant leap from roughly $22 million generated from food applications in 2014. I must admit, my attitude about Intrexon is beginning to change for the bullish given the tangible, near-term growth opportunities. However, most of Intrexon stock's gains in 2015 are the result of optimism about the company's healthcare partnerships, which mostly amount to future potential right now. Let's face it: No headline about cattle breeding product and services revenue sent shares higher -- nor will it. Despite the growth opportunities in food applications for 2015 and the continuing string of new acquisitions, the market is out of sync with reality at the moment. For that reason, I would tread carefully around the company's $5 billion market cap.